whistleblower | Westwood, NJ--Pascack Valley Blog. NJ Attorney Brian T. Giblin, Sr. Accused of Colluding with Dirty Judge to Violate Defendant’s Civil Rights. It is alleged that NJ Attorney Brian T. Giblin, Sr. colluded with dirty judge Harry D. Norton, Jr. in Upper Saddle River Municipal Court to violate the civil rights of a defendant. When the defendant tried to introduce evidence to impugn the State’s witness testimony, presented by Giblin, dirty judge Harry D. Norton, Jr. asked Giblin if he had been provided the evidence before trial. Why would a judge worry about discovery on behalf of the State? It’s not the judge’s place to make the State’s case. 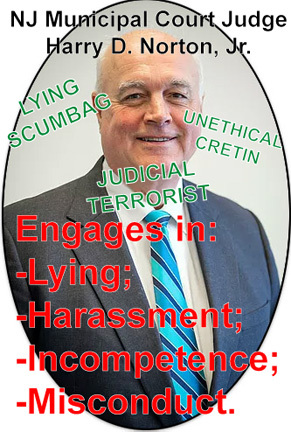 Yet, dirty Norton asked the question as a head’s up to Giblin that it was time to violate the defendant’s rights and orchestrate the defendant’s disadvantage. Having received dirty judge Norton’s predetermined signal, dirty attorney Brian T. Giblin, Sr. then objected to the evidence. Dirty Giblin knew that the judge would improperly sustain the objection, because on information and belief, the two colluded to orchestrate the disadvantage of the defendant. This would be known as N.J.S. 2C:30-2A (Official Misconduct). Why would an experienced attorney object to evidence that he made no request for? Any attorney should know that the court rules state that a prosecutor must make discovery requests in writing (See Rule 7:7-7(c)). A logical conclusion is that dirty attorney Brian T. Giblin, Sr. and dirty judge Harry D. Norton, Jr. colluded to engage in misconduct in Upper Saddle River Municipal Court on 5/22/2018. Since it’s totally improbable that an attorney of dirty Giblin’s experience would not know the discovery rules, it is reasonable to conclude that dirty attorney Giblin colluded with dirty judge Harry D. Norton, Jr. (Upper Saddle River) to engage in unethical legal practice with the intent of orchestrating the defendant’s disadvantage. We are seeking the disbarment of dirty attorney Brian T. Giblin, Sr., and for him to be permanently barred from public employment. You don’t want to do business with those alleged to engage in serious ethics violations. That means, you should think twice about doing business with Oradell, NJ law firm Giblin & Gannaio, since they count dirty attorney Brian T. Giblin, Sr. among their counsel. When you deal with those who lack integrity, you put yourself at risk.